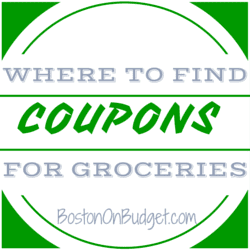 Have you ever wondered where to find coupons to use at the grocery store and more? I’ve actually been asked a few times at the store where I’ve printed off coupons online and wanted to share my favorite sources with you just in case you were wondering as well. The Sunday Newspaper typically has coupon inserts every Sunday and is a great first step is finding and using coupons. I usually buy the Boston Herald for $2 because it is cheaper than The Boston Globe, but you can find coupon inserts in other local newspapers as well. You may want to check out a Newspaper Coupon Preview before you head to the store, because the amount of inserts vary each week. For example, on holiday weekends (like Easter, Christmas, etc.) you won’t find a single insert but the following week may have 4. You can also have an idea what coupons are coming which is nice if you want to buy a few or not. Let me know if I missed any of your favorite ways to find and print coupons!